Marseille, gateway to Provence, is France's largest port and second largest city, with a vast history stretching back more than 2,000 years to its foundation by the Greeks in the 6th century BC. While much of the city is urban sprawl, it has a spectacular setting between dramatic limestone hills and the Mediterranean, and the once-industrial streets now feature stylish shops and cutting-edge art galleries, thanks to investment from its role as European Capital of Culture 2013. Most cruisers make a beeline for Le Vieux Port, a buzzing, picturesque harbor lined with boutiques, restaurants and cafes. This district attracts an eclectic crowd, from local fishermen to millionaires venturing ashore from James Bond-style mega-yachts. All gather to soak up Le Vieux Port's charming atmosphere, browse its bustling markets and tuck into a bowl of Marseille's classic signature dish, bouillabaisse (a rich fish stew). Cruise ships dock to the north of Le Vieux Port, in a large industrial zone which is rapidly being updated to appeal to ever-increasing numbers of cruise passengers. At present, this vast docklands -- which accommodates dry docks; ferries to Corsica, Sardinia, Algeria and Tunisia; and freight vessels as well as cruise ships -- is sprawling and far from pretty, and its cruise berths are set quite far apart. 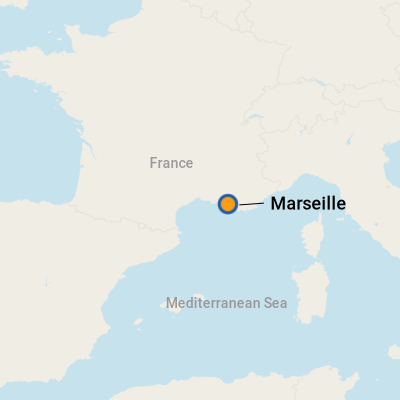 The Joliette Terminal -- which lies closest to the center of town -- currently has two berths for small to medium-sized ships, while larger vessels have to dock further out at a jetty, approximately six miles to the north of Le Vieux Port at the Marseille-Provence Cruise Terminal. The bad news is that passengers here have a longer journey into the heart of the action; the good is that parts of the terminal were renovated in 2014. Most passengers board a shuttle bus to Le Vieux Port and start exploring right away, but shopaholics will find an expanding range of retail outlets along the waterfront which links the cruise terminal to Le Vieux Port. It's best to head into the lovely, lively Le Vieux Port as quickly as you can, and leave closer-to-ship browsing for later, if you have time before returning to your vessel. Watch out for dogs. The French are very fond of little pooches, who run around at ankle-height and sometimes leave deposits on the sidewalk; remember to look where you're walking. Also beware of heavy traffic in the port area, and be sure to check hours of operation for any sights you're hoping to visit. Museums and most major attractions are closed on Mondays, and many local restaurants only serve lunch from noon to 2 p.m.
By Taxi: The ship's shuttle is probably the best option for reaching the Le Vieux Port, but taxis are also available at the cruise terminal. Costs vary, depending on how far out your ship has docked. On Foot: Once you're in Le Vieux Port, you're within walking distance of the major sights. If you want to go further afield, you can use the subway, which is safe, straightforward and accessible from Le Vieux Port station. By Train: Like most French tourist towns, Marseille has a "petit train" which rides past the main sights for a few euros. The journey will give you a good overview of the local charms if you're strapped for time. It operates roughly every half hour from Le Vieux Port's Quai des Belges; tours take about one hour. Note: It may be worth investing in a 24-hour city pass (available from the Tourist Office). It costs around 25 euro per adult and allows free use of the city's public transport system, free entrance to most of its museums, 10 percent discounts at certain stores, and other perks including free rides on the petit train and on the ferry which runs from Le Vieux Port to the Isle of Chateau d'If. The official currency is the euro; for the latest exchange rate, visit www.oanda.com or www.xe.com. You'll find ATMs around the cruise terminal and Le Vieux Port. English is widely spoken and understood in Marseille, particularly in restaurants. But don't assume that everyone speaks it. Win favor with the locals with a few basic phrases, including "merci beaucoup" (thanks very much) and "l'addition, s'il vous plait" (the bill, please). If you're happy to rely on serendipity, stroll around Le Vieux Port, along the quai du Port, quai du Rive Neuve or around nearby Place Thiars, a pleasant square lined with al fresco eating areas. Here you'll find many restaurants offering classic French lunchtime dishes such as moules, steak-frites or the local favorite, bouillabaisse. Just follow your nose, and your instincts. Marseille is a shoppers' delight, with a broad variety of shops and markets. The Old Harbour's Craft Market is a great choice for regional souvenirs such as fragrant Provencal soaps, locally-produced honey, olive wood bowls and prettily-carved santons (Nativity figurines for Christmas creches). Though wine is the national tipple in France, the locals are increasingly getting into beer and the city now has its own microbrewery, Biere de la Plaine (16 rue Saint-Pierre). It supplies local bars with fruity, home-grown brews which come in many versions, including blonde, wheat and pale ale.